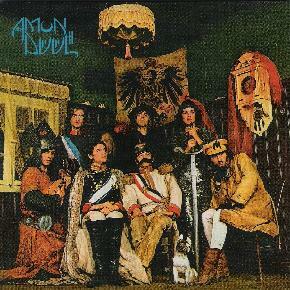 Amon Düül II - "Made In Germany"
Originally released in 1975, as I always thought this was a compilation. As it turns out, 'Made In Germany' was actually meant to be a 'rock opera', which is hard to picture a band like ADII doing. 'Made...' does have the band stepping in a different direction. Sort of 'theatrical kraut' if you would call it that. There was apparently two different releases of this title. This GoD-label pressing is the longer version, with twenty tracks and a duration of 69:51. As for the tunes, I thought a good most of them made the grade, such as the rocking "Wir Wollen", the acidic guitar drenched "SM II Peng"/"Elevators Meet Whisper", "The King's Chocolate Waltz", the trippin' "Three Eyes Overdrive" and the somewhat Dylan-like "Emigrant Song" (no, not a cover of the Zeppelin song). But,wait there's more. Renate Knaup's hot female vocals certainly brings things together on "Metropolis", "Blue Grotto" and "Wide Angle". There were several cuts that I thought did manage to possess that unforgettable classic Amon Duul II sound, vibe and spirit that we all have come to love and simply refuse to let go of, which were "Loosey Girls" (nice sax solo), "Top Of The Mud", "Gala Gnome" and "La Krautoma" that features some truly incredible guitar work by none other than one of ADII's mainstays Chris Karrer. Wanted to mention just one more song, the almost nine minute cut "Mr. Kraut's Jinx", the disc's lengthiest track that gets much better as it progresses. There is maybe one or two tunes here that are a little to artsy-fartsy for me, but in the long run, most ADII fans would most likely enjoy this very well assembled reissue. Line up here is: Chris Karrer-guitar&vocals, John Weinzierl-guitar, Falk-Ulrich Rogner-keyboard, Renate Knaup-vocals, Nando Tischer-guitar&vocals, Peter Leopold-drums and Robby Heibl-bass. Comes with a lavish 28-page booklet with some of that beautiful/priceless ADII LP artwork and lyrics to the CD's tunes. If not a must-have, it's definitely a should-have. Both old and new fans of the group should find this title to be at least satisfactory. Long live ADII!